The Acorn Area™ is designed to measure the wetted surface area of nanoparticles in liquids. This patented (NMR) based method offers many advantages in comparison with conventional surface area techniques. Measurements take about 5 minutes from start to finish. No sample preparation— such as drying or degassing— is required. High concentration samples are measured directly, without dilution. Acorn Area measurements are orders of magnitude faster than any other surface area measuring technique. The wetted surface area of particles influences many aspects of product performance. For example, the hiding power of pigments, the activity of catalysts, the potency and bioavailability of drugs. 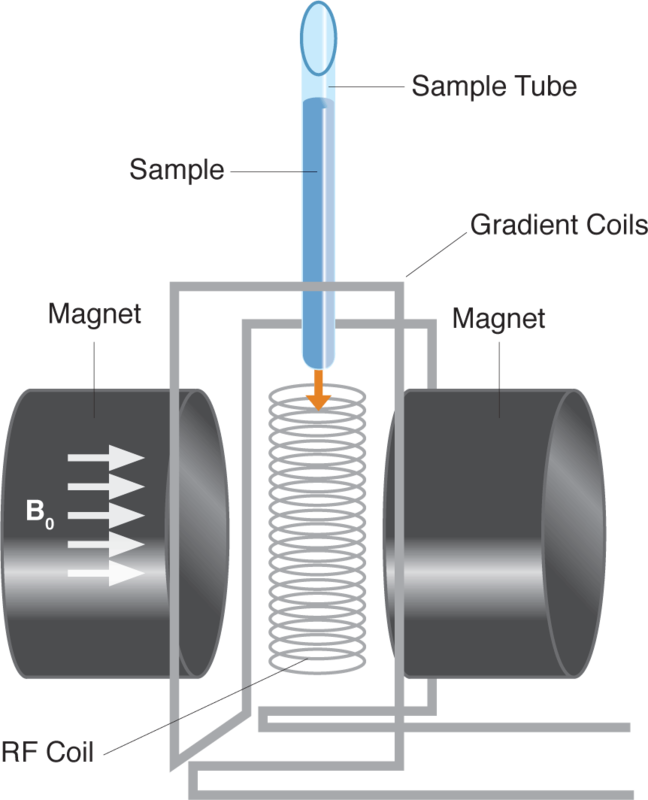 In the past, surface area measurements were made using methods such as gas adsorption, mercury porosimetry. These methods are only useful for analyzing dry powders. However, the majority of products involve particles in a liquid, either in the final state or at some stage of production. While dry powder methods are suitable to test incoming dry powder raw materials, they cannot provide information about the particles in liquids. To date this has not been possible other than to estimate the surface area from particle size measurements or to perform time- consuming adsorption isotherm or titration measurements. Liquid in contact with the particle surface behaves differently from that of the bulk, or “free” liquid in response to a changing magnetic field. The NMR relaxation time of liquid on the particle surface is much shorter than that of the bulk liquid. This difference can be several orders of magnitude. The relaxation time of particles dispersed in a liquid is an average of the two relaxation times, weighted by the relative amount of liquid on the particle surface and that in the free liquid. This is a direct measure of the particle surface area. To make a measurement, place a 0.5 ml sample in a sample tube and insert it into the Acorn Area. The sample resides within a coil located between two permanent magnets. A static, uniform magnetic field, Bo, causes the protons within the liquid to align with Bo; this process typically takes a few seconds. At the start of the measurement, a short radio frequency (RF) pulse excites the coil at a frequency of approximately 13 MHz. 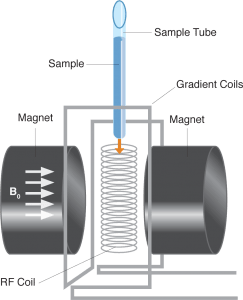 This pulse produces a large magnetic field, inducing a temporary shift in the magnetic orientation of the sample protons. When this induced field ceases, the protons of the sample fluid then realign with the static field, Bo. This realignment induces a decaying voltage in the coil. By using specific RF pulse sequences, the sample T1 (longitudinal) and T2 (transverse) relaxation times are measured.Although T1 and T2 are different, their shift between liquid in the bulk and liquid on the surface is similar, and both can be used to determine the wetted surface area. AreaQuant™, the Acorn Area software,measures T1 using an inversion recovery pulse sequence, and measures T2 using the CPMG pulse sequencing method. The resulting data are analyzed to determine the relative proportion of surface and bulk liquid and the corresponding wetted particle surface area. There are no assumptions about the sample particle size (distribution) or shape used to determine surface area; the wetted area is measured directly. The user inputs the particle dispersion weight concentration, the liquid and particle density. The particle-to-liquid volume ratio (used in the calculation of surface area) is automatically determined. There are two Operational Modes in the software setup: Standard (or QC) Mode and Advanced (or R&D) Mode. The former is the mode used to measure surface area. In R&D mode, the instrument behaves like a traditional NMR spectrometer capable of a wide range of low-resolution NMR measurements. Measurements with the Acorn Area are simple and easy. Dispersions can be measured non-invasively, without dilution. The upper limit in concentration is essentially unlimited; the lower limit is about 1-2%. Using this automatic mode, AreaQuant™ then determines all the measuring parameters needed such as the amplitude and duration of the pulses, the number of repetitions, etc. without operator intervention. This ensures measurements are made with the highest resolution and repeatability without a great deal of operator training. To simplify method development, the software also features an automatic test parameter file configuration based on an estimated T1 or T2 time input by the user. Once a set of parameters are defined, operation of the Acorn Area is simple: just enter the operator name and sample information – the software does the rest! AreaQuant™ operates on virtually all Windows Platforms, including XP®, Vista®, and Windows® 7,8,& 10. Data files are saved in XML format, easily opened with Microsoft Excel or Open Office. Reports are saved in PDF format. Graphs may be copied to the clipboard or saved in JPG or PNG formats while tabular data can be copied to the clipboard. To make sure you are using the most up to date software available, updates may be downloaded and installed via the internet with a single click of the mouse.